You are on vacation on a beautiful caribbean island, when suddenly a bunch of mutant coconuts (due to the effect of obscure military practices) threaten to destroy the beaches. Only you can help catch all coconuts before they can annihilate the island! 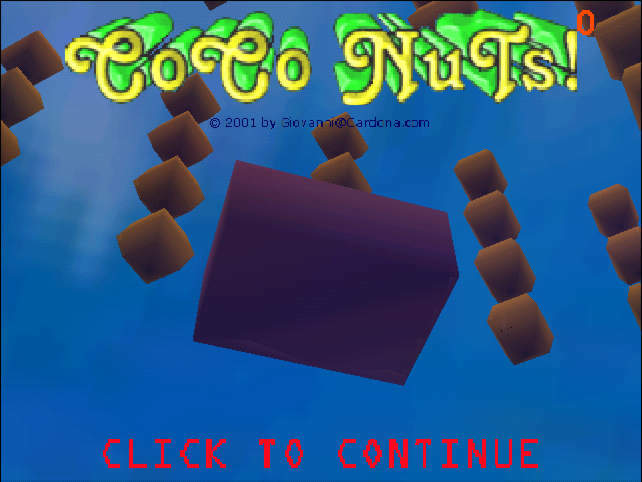 You control a little piece of wood block with your mouse to catch the falling coconuts. In order to enjoy the perception of being in the ocean, visualize your mousepad as the 'ocean' and the coconuts 'floating' over it. This game is good practice for visualizing depth with your mouse and it plays great on laptops! This is a 3D game that can run on many old machines, but requires a real 3D capable video card. 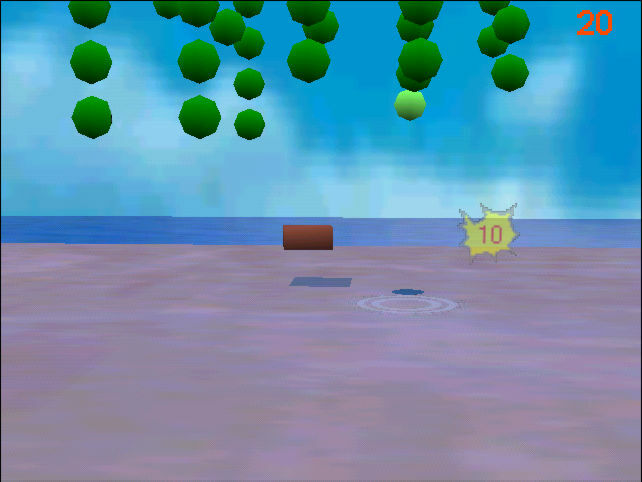 The game makes use of an external MOD music player for enhanced gameplay, but it is not required. The source code and project can be found in the Jamagic CD!. Note that some video cards works better when you switch your desktop to 16 or 32 bits colors for faster 3D display. Press here to play it in your browser now!. It's only a 177k download if you already have the Jamagic browser control. The plug-in will automatically start downloading if it not found. Please wait for the full download (about 2 mb) if this is the first time you play a Jamagic game on the net. The music Module used in this game is only a part of a larger 'dancing mix' composed by Giovanni Cardona in 1993 on an Amiga computer. NOTE: the source code and project are for educational use, as a tool to learn Jamagic and is free to use as long as you run it from the Jamagic environment and don't compile and/or use it for commercial purposes. MIDI and MOD musics are a copyright 2003 of Innavoig Software.